This is a short term fishing rig as it only lasts for about an hour before the tablet fizzes out. For this reason, it can be a great carp fishing rig for roaming around the swim with single hook bait tactics. Sometimes you may need to place a weighted shot on the hair in order to pull the bait to the bottom. This will depend on how buoyant your pop-ups baits are. The weight will pin the boilie down but, as the tablet fizzes away the buoyancy increases and the bait gradually pops up. This type of rig presentation is one of the best for fishing in-between weed, or on the edge of weed beds. 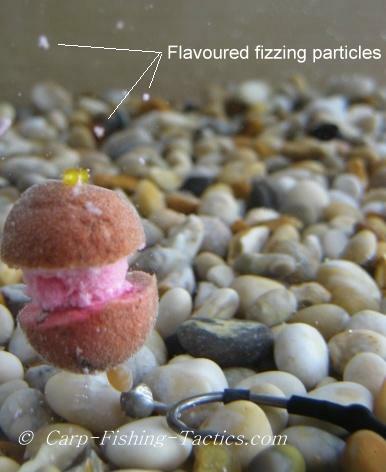 A photo of how the fizzing burger carp rig look from above. Sometimes I like to use two different halves of pop-up boilies, so if one colour doesn't attract the big carp, then the other colour or flavour may help. After about ten minutes in the water, small particles of flavour are released from the tablet. This helps attract any carp that may be passing above. 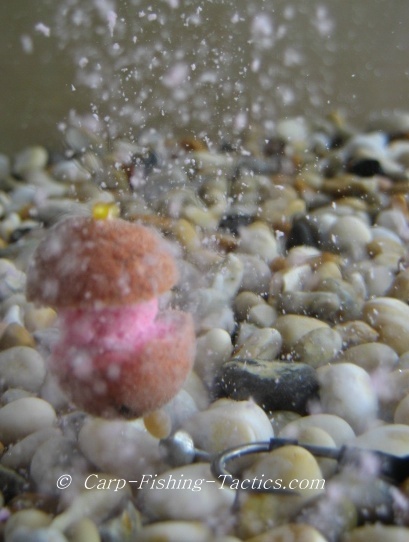 Fizzing tablet explodes when carp touch bait, releasing huge amounts of flavour! After 30 minutes, the tablet has mostly dissolved but the majority of particles seem to hold between the two halves of the boilies. At this stage, If it's touched by any fish it will explode - cool! 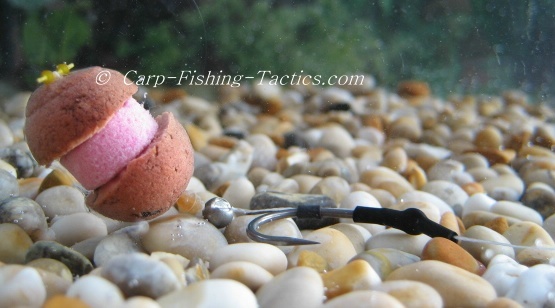 Here is another fizzing boilie rig using a different colour bait. The pop up was so buoyant that I had to trim off the edges to help it to sink properly. 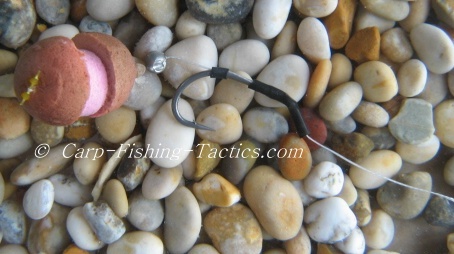 If the pop-ups are very buoyant, you can use one half on the top, but then use a bottom bait half for the bottom section. 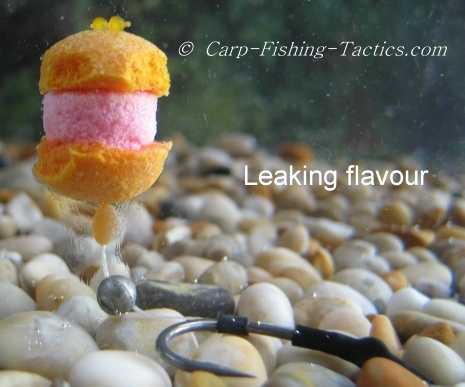 Notice the flavour leaking out of the bottom of the bait- what great attraction!! I prefer to create this fishing rig as a combi-link style set up. The braid section is super silk, as this enables me to colour the braid to suit the lake bottom. Make sure you have a fairly long hair, and then place a small, rubber rig stop on the hair before placing on any boilies. 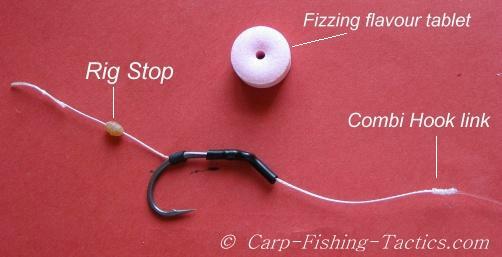 The fizzing tablets can be bought from any good tackle shops in the UK. There are many flavours and colours to choose from. 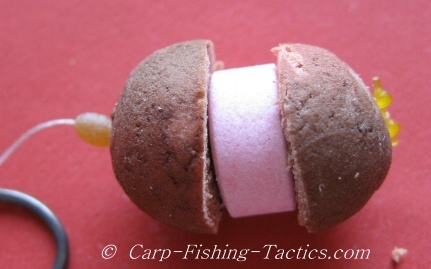 Carefully cut a soft pop-up boilie in half. For safety reasons it may be best to cut the boilie using a knife, and cut down away from your fingers!! 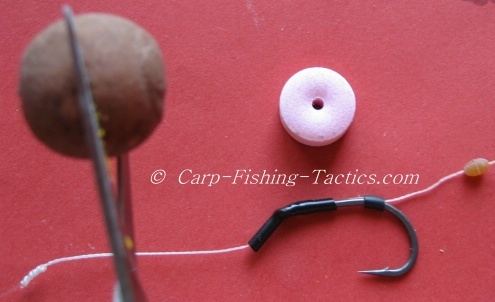 Using a bait needle, place one half onto the hair, making sure the round side is facing the bend of the hook. Thread on the tablet, then slide on the other half of the pop-up, this time making sure the flat side butts up to the tablet. Now place a bait stop in the hair loop. It should look like the photo below! 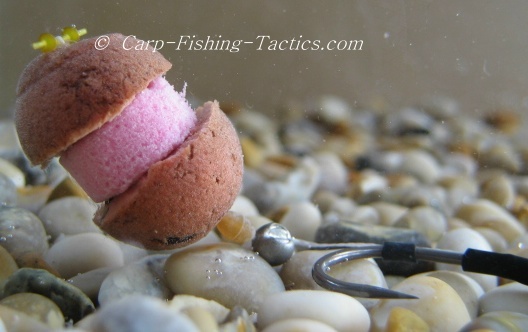 Push the rig stop up against the bottom of the boilie once the bait stop is in place.